WASHINGTON — The commemoration of Martin Luther King’s Birthday on Monday became a day of confession, invective and promise for prominent Democrats, who used events across the country honoring the slain civil rights leader to try to inoculate themselves from criticism, lash out at President Trump as a racist and, in one case, begin a history-making run for the White House. From the nation’s capital to the South Carolina Statehouse to the Rev. Al Sharpton’s storefront headquarters in Harlem, the gatherings were solemn, spirited and reflected the fraught nature of what would have been the Rev. Dr. Martin Luther King Jr.’s 90th year. They also reflected the political imperative of reaching out to black voters who are a crucial part of the Democratic coalition and are increasingly demanding accountability on race from their own leaders. 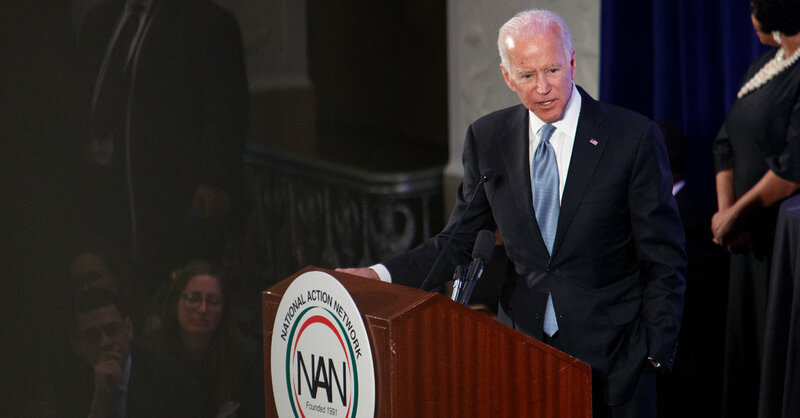 Taking the podium at a breakfast in Washington, former Vice President Joseph R. Biden Jr., who was first elected to public office the year after Dr. King’s assassination, acknowledged that more was expected of him at this moment. Mr. Biden said he regretted supporting the tough-on-crime drug legislation of the 1980s and 1990s, expressing remorse in particular over a bill that created different legal standards for powdered cocaine and street crack cocaine. Mr. Biden’s remarks, at an event hosted by Mr. Sharpton, served as a pre-emptory move to head off criticism of his past policy decisions and made clear that he is both seriously considering a presidential bid and recognizes the hurdles he would face from his increasingly progressive party. But he was not the only potential White House contender in attendance at Washington’s Mayflower Hotel with a record on criminal justice issues that leaves some African-Americans uneasy. Former New York Mayor Michael R. Bloomberg also spoke, but he avoided any mention of the controversial policing tactic he supported in New York called “stop-and-frisk,” which gave police officers sweeping powers to detain — and sometimes harass — those suspected of committing crimes, particularly in neighborhoods with predominately nonwhite residents. Mr. Bloomberg did discuss a series of events that had shaped his recent thinking about race. In one example, he said he recently learned about the deadly race riots in which white residents destroyed the Greenwood district of Tulsa, Okla., in 1921 and murdered several dozen black residents. Several audience members said they appreciated how Mr. Bloomberg and Mr. Biden spoke to Dr. King’s legacy and the issues of civil rights. But it was not difficult to find skepticism in the audience about whether they will be able to reckon with their past policies. “It all just sounds like 2020 is getting closer,” quipped Christian Taylor, a 29-year-old consultant who attended the breakfast. In South Carolina, where the 2015 mass killing by a white supremacist prompted the state’s governor to remove the Confederate battle flag from the statehouse grounds, about a thousand people gathered in Columbia for a rally that has become a marquee event on the political calendar of a crucial early nominating state. Senators Cory Booker of New Jersey and Bernie Sanders of Vermont, both likely presidential candidates, spoke to the attendees after attending an early-morning prayer service and marching with N.A.A.C.P. leaders to the capitol. It is an annual rite that began in 2000 as a protest of the flag that once flew above the statehouse dome. The day was drenched in history. The church that hosted the service, Zion Baptist, was poised to host Dr. King in the spring of 1968, but he postponed a trip there to remain with striking sanitation workers in Memphis, where he was assassinated. When the procession arrived at the capitol on Monday, a handful of speakers were blaring Dr. King’s oratory from the foot of a monument to Confederate soldiers, the last site of the Confederate banner. The two senators used their remarks to hail Dr. King, each in a way that foreshadowed their likely campaign messages. But he also warned against using vitriol toward political adversaries. Mr. Sanders sought to link his signature call for “a political revolution” with the life of Dr. King. “King had a revolutionary spirit, yes, he was a revolutionary,” Mr. Sanders said before outlining an array of racial justice proposals that demonstrated both his leftist politics and how eager he is to improve his performance with black voters from 2016. He was soundly defeated by Hillary Clinton in South Carolina’s primary. “We know that we’ve not yet reached those ideals, but our strength is that we fight to reach those ideals,” Ms. Harris said of Dr. King’s aspirations. The daughter of immigrants from Jamaica and India, Ms. Harris is perhaps the most formidable black woman to ever seek the presidency. And she sought to highlight her history-making potential, airing a video that echoed “Lift Every Voice And Sing,” the so-called black national anthem, and addressing reporters at Howard University, the storied historically black school from which she graduated. While Ms. Harris’s candidacy carried promise to some Democrats, the current president was more on the minds of others in the party, and it produced some of the fiercest language of the day. With his divisive language and policies, Mr. Trump regularly invites accusations of bigotry. “It gives me no pleasure to tell you that we now have a president of the United States who is a racist,” Mr. Sanders said in his remarks, drawing applause from a crowd that preferred to call Mr. Trump “45” than mention his name. At Mr. Sharpton’s headquarters in Harlem, Representative Hakeem Jeffries of New York, the fourth-ranking House Democrat, was just as blunt. His remarks were met with some surprise and much cheering from the teeming 145th Street gathering of the National Action Network. For his part, Mr. Trump, joined by Vice President Mike Pence, made a surprise appearance at the monument to Dr. King in Washington. The president laid a wreath at the memorial but only stayed briefly and said nothing about the man being honored. “Great day, beautiful day,” Mr. Trump told reporters. But at events across the country, Democrats scorned the president for the government shutdown and linked it to what they described as his racism. “As we speak, our government is shut down for one reason: So that the president of the United States can fund a monument to hate and division along our southern border,” Senator Elizabeth Warren of Massachusetts, another 2020 candidate, said at a breakfast held in memory of Dr. King in Boston. Ms. Warren, like the other Democrats eying the White House, has tailored her rhetoric to appeal to an increasingly diverse and progressive party base that expects concrete and uncompromising plans for pursuing racial justice.